Indian Summer and Golden Autumn - The time is approaching to have great tea in the evening and you can breath in the delicious smell of apples roasting in the oven. During the day, the weather is sometimes extremely nice, mild temperatures and amazing visibility – the perfect time for mountaineering. After a long walk uphill a hearty meal like Kasnockn in one of the chalets is more than welcome. Thanks to some rainy and wet days during summer, the season for funghi and mushrooms started very early and our funghi recipe of roast chanterelles is amongst our most popular recipes for weeks. As long as balcony and garden are free of frost, you can still collect herbs and preserve them for the colder months to get some natural power on your table – try out our parsley pesto recipe. The most typical preserving method is making marmalade, jam, chutney and relish. And as other pople know other great recipes and have different fruit and veggies in their garden it is great to exchange each others jams: best do this with beautifully decorated jam jars. Without doubt for us autumn is a time that has a lot to do with pausing and enjoying, well thanksgiving so to say. Pausing and Enjoying, that's not only with culinary delights, enjoying what the nature brought us during the last months, it means the time for crafting is back. The evenings, that are too cool to stay outside or where you need a shawl or scarf around your shoulders. In September hooks and needles are in use, to knit and to crochet like this small decoration: an embroidered crochet basket. 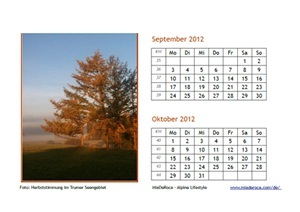 Download Your Calendar Sheet for September and October 2012 now: September and October Calendar Page (pdf).